Portland: The Dream of the 90’s is alive… just not on menus. 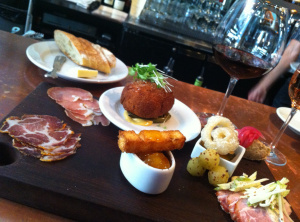 Charcuterie Board, Little Bird Bistro. James Beard Award Winner Gabriel Rucker’s more laid back French concept in downtown Portland provides easy access to well prepared food and a well-managed wine list. We sat at the bar for lunch, where dishes ranged from traditional cassoulet to a tartine with cucumber, tomato, and fresh tuna. The scotch egg was amazing, the gooeyness oozed with slight mustard, but nothing could outshine the terrine with apricot glaze. Smooth, melt in your mouth good. That is all. 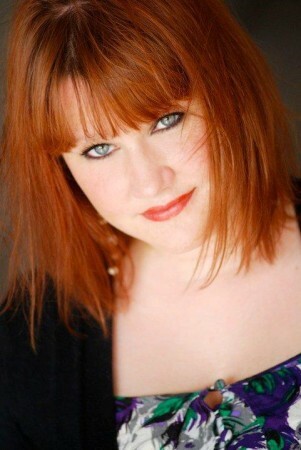 Just go there, or to Rucker’s more refined concept, Le Pigeon. If you have been to Portland, you know that Portlandians love to wait in line. PokPok is no exception, as it is almost impossible to walk in, and even if you have a reservation, your table is only guaranteed for two hours. The humble interior boasts simplicity, but the Thai dishes are quite the contrary, with layers of infused flavors, both ying and yang equally represented. No wonder Chef Andy Ricker is also a James Beard Winner. The Hoi Thawt (broken crepe with fresh mussels) was my personal favorite, followed by the Khao Soi (noodles in mild curry sauce) and night special, whole fried tilapia. Don’t sell yourself short. Order a the fish sauce wings and an amazing craft cocktail. 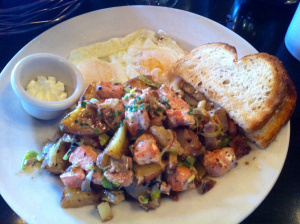 Wild Salmon Hash, Mother’s Bistro. While the ambiance of the establishment literally reminds me of a place I would take my parents for brunch, you cannot deny the most wonderful smell of brewing fresh coffee to liven your senses. Stumptown Coffee, a local Portland favorite, created a special blend just for Mother’s, with an Ethopian style to recharge your soul, complete in French press. That being said, the menu was avast with most brunch comfort foods that one wants when hungover: benedicts, biscuits with gravy, omelets, and crispy French toast. The wild salmon hash was surprising, with large chunks of fresh fish pinkishly shining off my plate. Let’s admit the obvious: you can’t go to Portland without eating from a food truck. 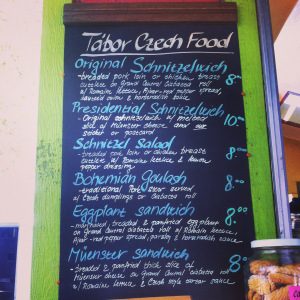 After passing by various clusters, we happened by the Tabor Czech Food Cart. Known for their Schnitzelwhich, consisting of breaded pork with horseradish and red pepper spread on ciabatta- a YUM from the get-go, I was also impressed with more traditional Czech dishes available. Notably, Bohemian Goulash. This meat stew is widespread throughout the Czech culture, and prevails as the most loved by my extended relatives (for a post on our reunion dishes, click here). Another gem available at the cart is fresh pressed carrot juice. A hearty 12 ounce serving for only $2. Prosit! Seared Pork Belly with Morels and English Peas, Wildwood. Well known for fine Northwest cuisine, Wildwood’s menu was simple, yet elegant. Our entire meal was our most remembered, from a gazpacho amuse bouche, to mussels with chorizo, fennel and argula salad, flank steak with grilled asparagus, and chicken paillard. Even the berry sorbet was well crafted. And the wine list… should I even mention the sommelier jumped out of his chair at the sight of an Andre Clouet 1911? Amazing champagnes aside, my favorite was the seared pork belly, accompanied with morels, tomatoes, and gentle English peas. I literally licked my plate. 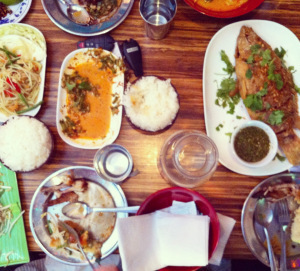 Needless to say, you could spend a lot of time in Portland, and never eat your way through. You will wait in lines, however. Cheers! It’s Willamette, Dammit: exploring Oregon Pinot. In Oregon, in July, it’s cool and crisp in the morning, and warm in the afternoon. 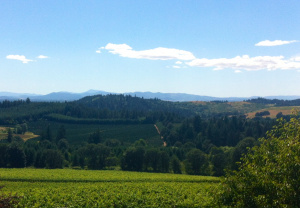 Driving through Central Willamette Valley, we pass by apple orchards, vineyards, wildflowers, and farms. You can see the thick green hills in the distance, gently swaying in the NW breeze. It’s like a post card, really, except the speed limit is 55 and there’s no sense of urgency. It’s a strange feeling: not being in a rush. We kind of don’t know how to handle it. The hills and valleys are typical of other West Coast wine regions; small country roads intertwine at the plateaus overlooking rows of bright green vineyards. at them. My favorite was the 2011 Ava Lucia Pinot Noir: light and slightly fruity and very smooth, it was obvious these guys know what they are doing. Only 355 cases produced. Available online for $35. Brooks Winery, humble to its core, was a nice change to the hustle and bustle of Durant. It consists of 23 labels, one of which was featured in an Obama White House Dinner. 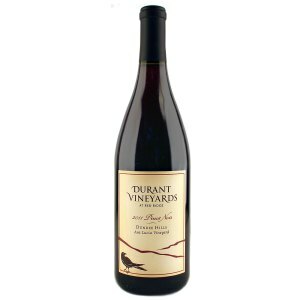 The 2011 Janus Pinot Noir, just recently bottled, is very typical of a Willamette Valley Pinot, subtle, easily drinkable, and much less fruit forward than its Southern Cousins in California. 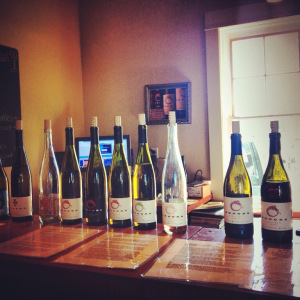 Brooks is a small, family winery, focuses on keeping traditions alive, and raising winemakers. They have a wonderful story, beautiful wine, and a laid back attitude. While the 2011 Janus is not yet available for purchase, the 2010 is available online for $35. Because the commercialization of wine highways are kept to a minimum, the most beautiful thing about Oregon can be kept natural. The scenery itself is worth the visit. I know we’ll definitely be trying more Oregon Pinots from now on. Oh, and then there’s Portland. You can’t miss it.